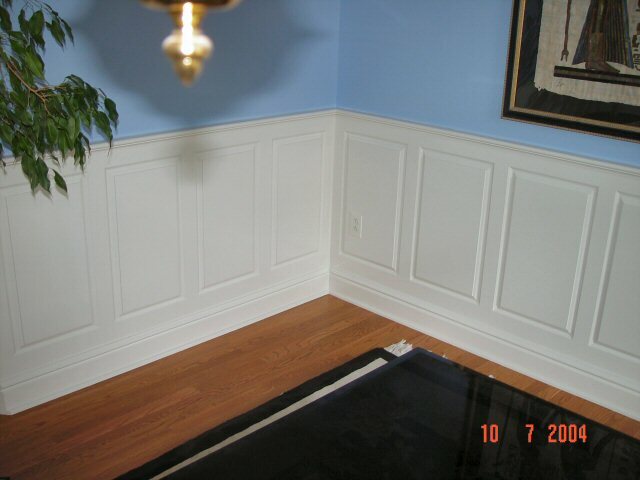 This is raised-panel wainscoting I installed in my dining room. 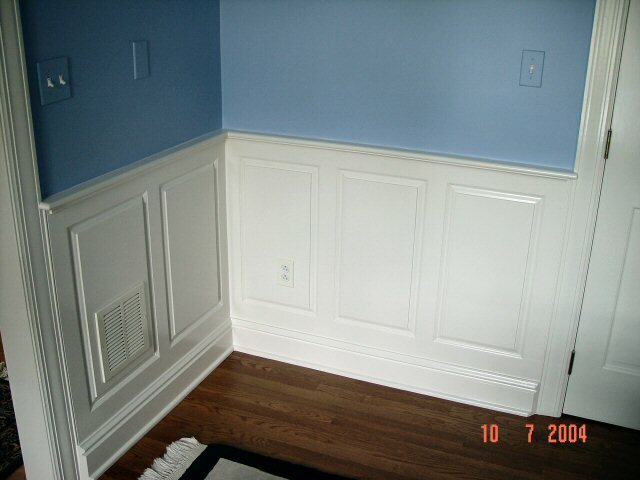 The panels, rails, stiles, scotia and bullnose chairrail are all made from 3/4" medium density fiberboard (MDF), cut on my tablesaw and milled on my router table. There is a grand total of 28 panels. While installing this, I had to move 3 outlets that would have been located on a panel/stile boundary, extend all 6 outlet boxes, extend the central vacuum outlet and resize a return duct vent that was 16" wide originally (much wider than the panel). 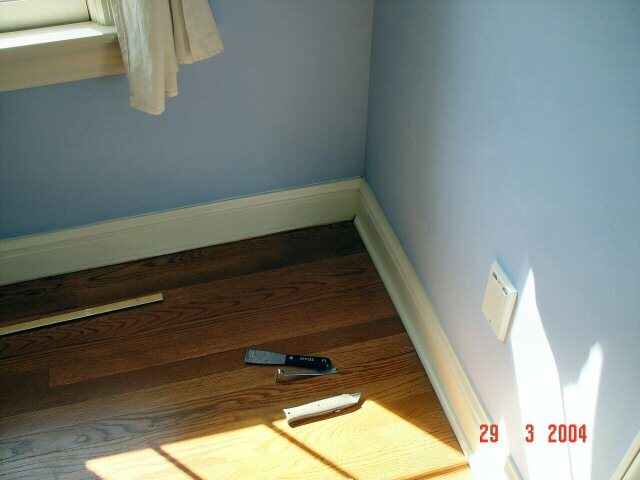 As a reference, I primarily used, Trim Carpentry and Built-Ins, by Clayton DeKorne from the Taunton "Build Like a Pro" series. The chairrail is 36" high. The references indicated that panels should approach a height to width ration approaching the "golden mean" or 1.6 to 1 ratio. In order to calculate how many panels to place in a region, I started with a fixed panel height of 24.25" (this gave 36" high chairrail) and computed how many 15" wide panels I would need. I then adjusted the panel width accordingly. One corner panel fell exactly half way between two thin panels and one wide panel. I (my wife) opted for a single large panel and I saved myself some work. 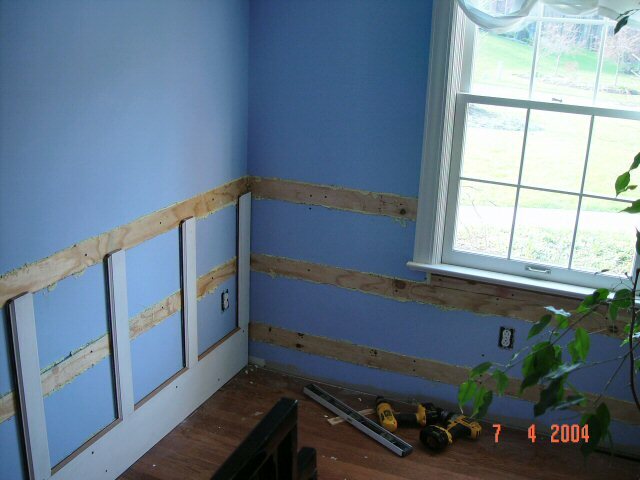 I treated the areas around the windows as separate regions, hence the low and wide panels under the windows. 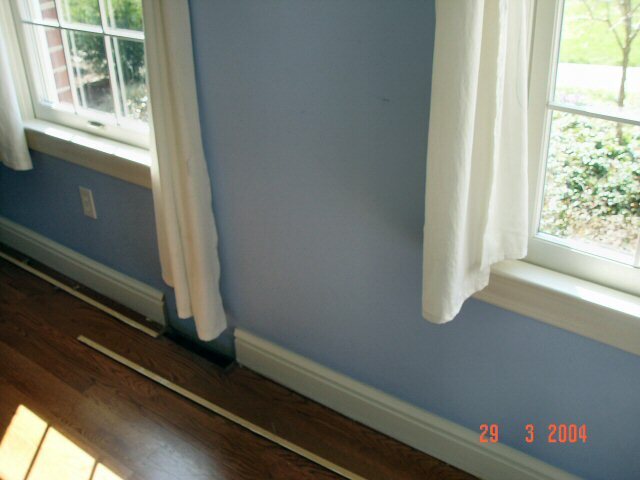 To start, I carefully removed the shoe molding, baseboard and window aprons in the room. 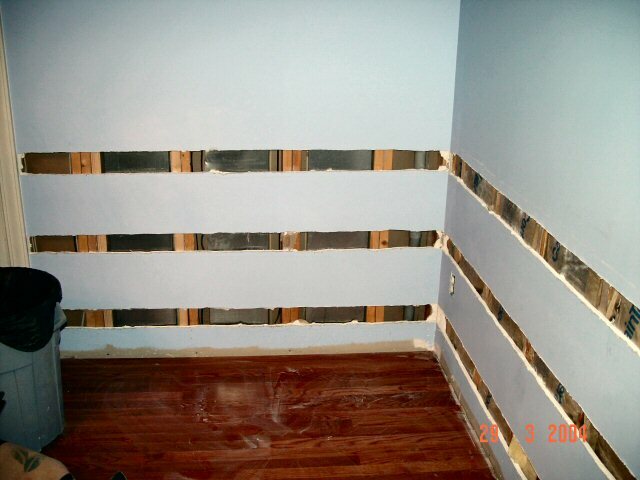 Then I roto-zipped three strips of drywall away and filled them with 1/2" plywood. 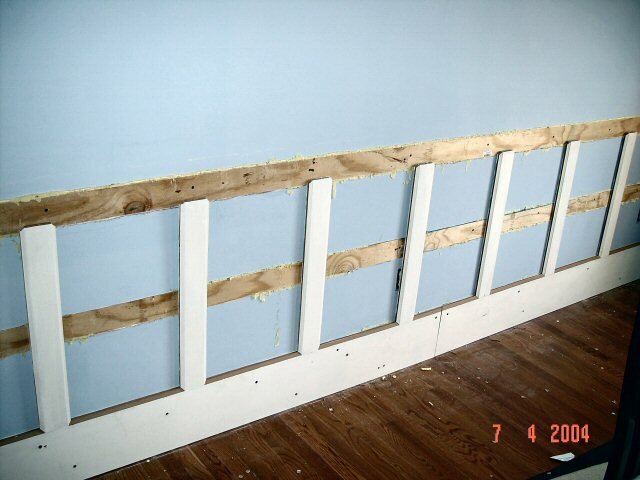 This was the backer to which I screwed the rails and stiles. 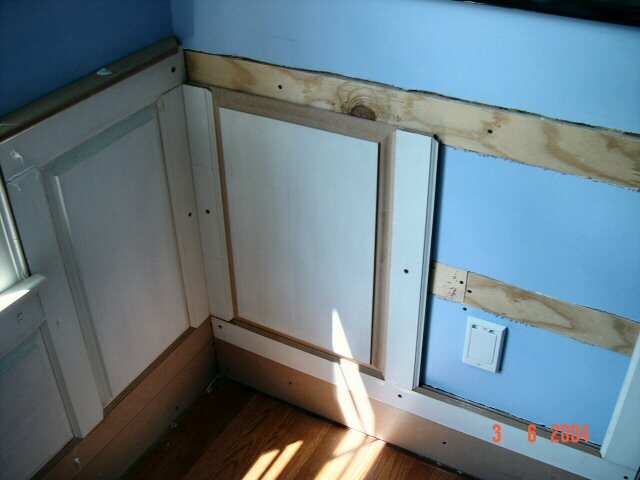 The panels are unattached and "float" in the frames. For short runs, I built the wainscoating as one piece and installed it whole. 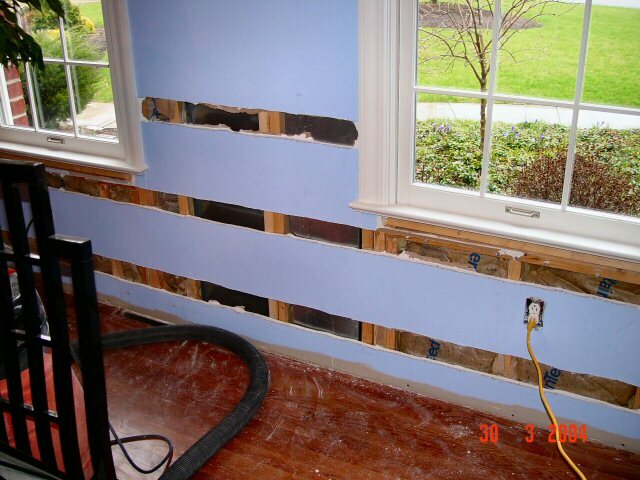 Longer runs required piecemeal construction. 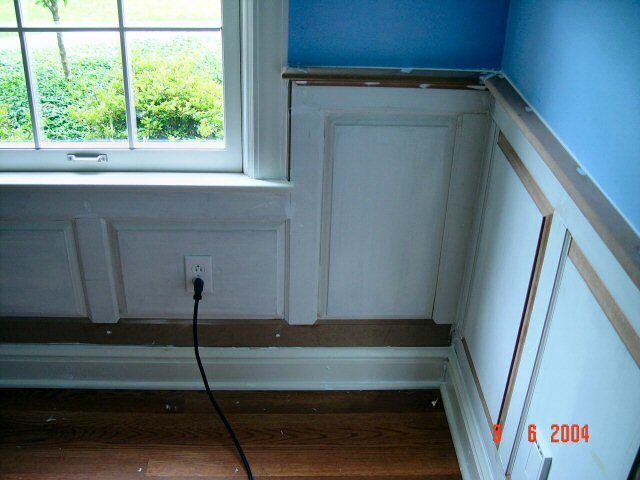 Once the top rails were applied, I topped them with a bull-nosed chairrail and then added the detail of the scotia molding underneath. 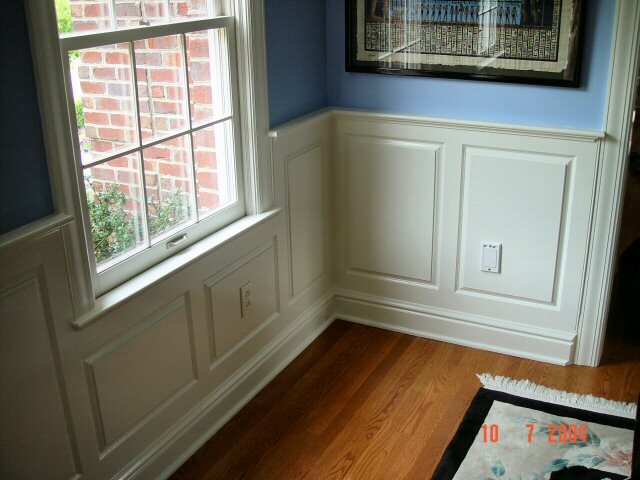 Where the chairrail meets existing vertical trim (e.g. 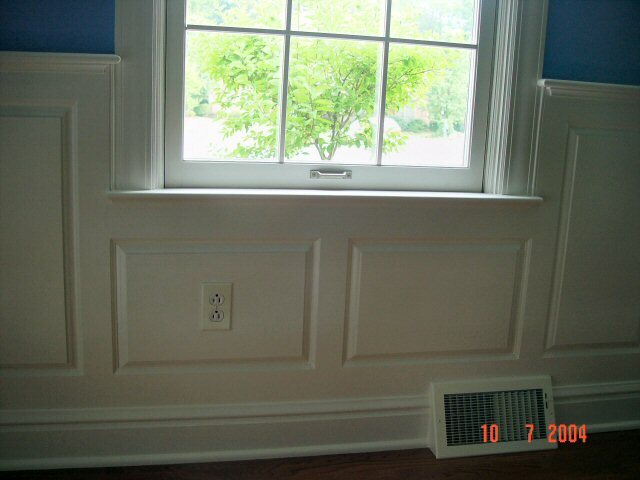 around windows and doors) it was "woven" or overlapped with the molding. 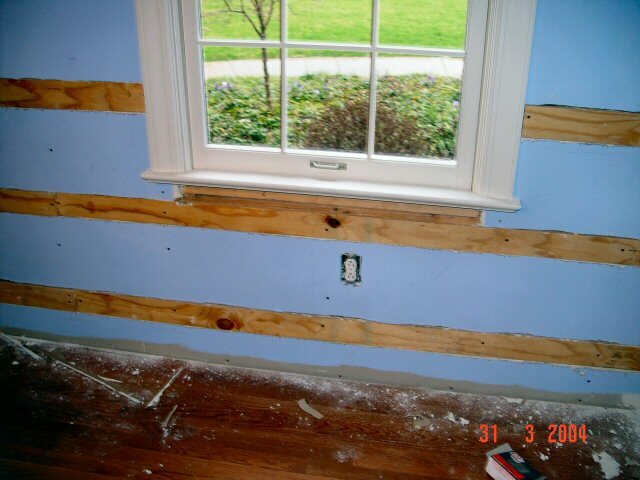 Likewise, the window sills were cut away from the wall to permit the stiles to lie under them. 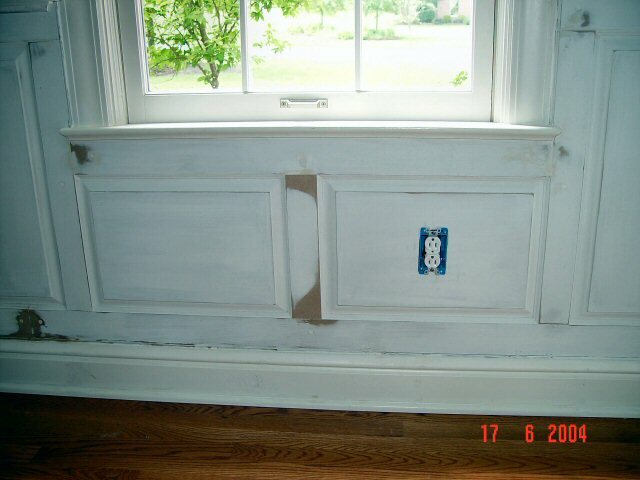 This effort tied together old and new molding details. 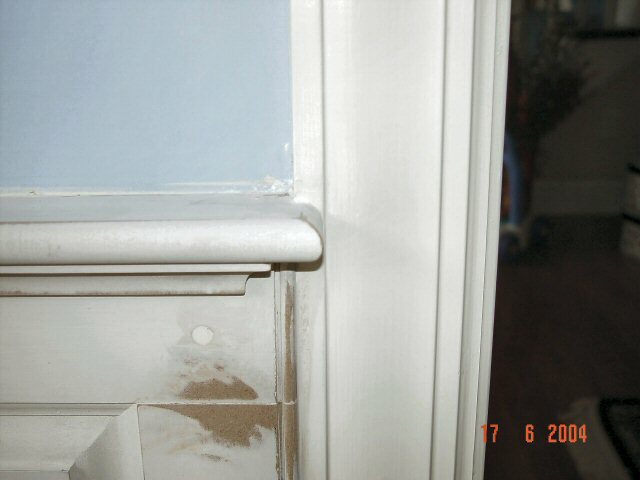 Finally, stiles which paralleled door or window trim had an additional bead detail added. 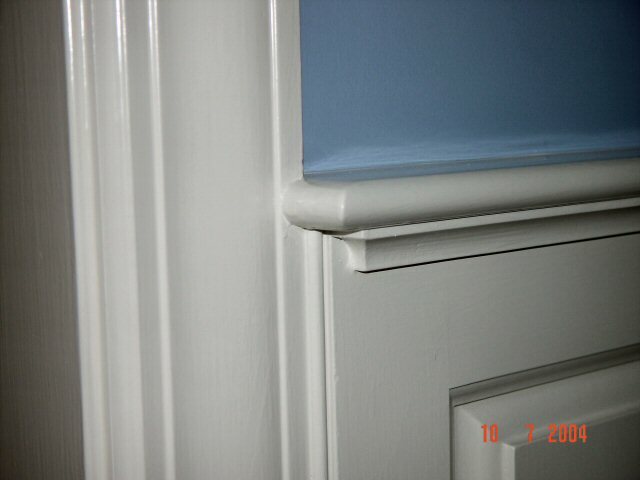 This provides a graceful transition between the two trims types because the stiles were 3/4" thick to the window/door trim which was 5/8" thick. All these details I learned during the process. One point I learned after I had primed the pieces was to use an oil-based primer to minimize raising the grain. 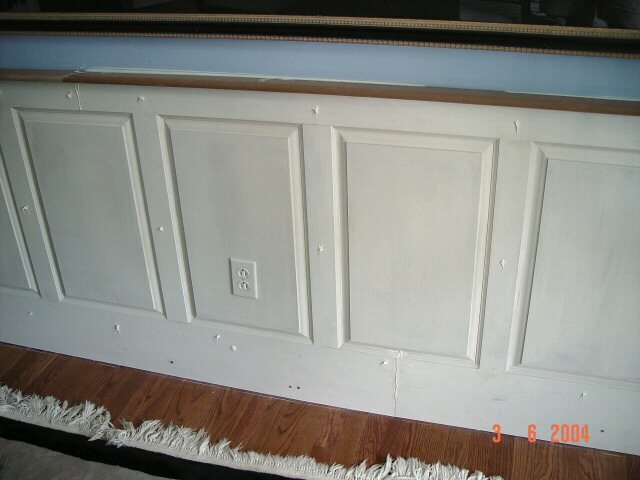 I learned this after spending three days sanding all the routed edged down that had been primed with a latex primer. I couldn't figure out a way to re-apply the window aprons and not have them stand proud of the sills, without rebuilding wider sills, so I opted not to re-install them. I don't think the result suffered. 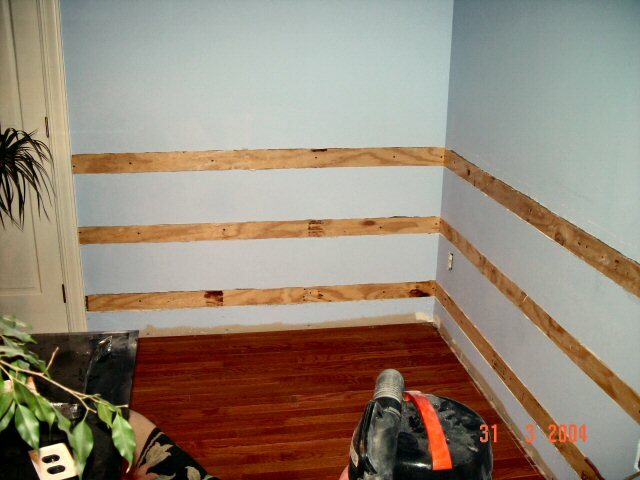 I'm pleased with the results and once I forget how much work this was, I plan on doing one more room in the house that requires this formal approach.